The second reading of the General Revenue Appropriation Bill for Fiscal Year 2013/2014 took place this morning during a meeting of the House of Representatives. 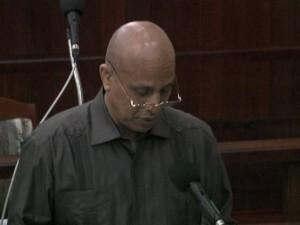 The presentation of the budget proposals for the upcoming financial year was made by Prime Minister Dean Barrow. He emphasized that the impending fiscal calendar will not see any new taxes being introduced, nor will there be any budget reductions. P.M. Barrow also lauded the accomplishments of his administration in restructuring the super bond, as well as other economic developments in 2012, notwithstanding a sudden decline in electricity production, crude oil mining and cruise tourism arrivals. “Preliminary estimates compiled by the Statistical Institute of Belize indicate that our economy grew by five point three percent during 2012, well above the one point nine percent recorded for 2011 and just about the best in the Anglophone Caribbean. The growth is attributable to brisk activity in agriculture, agro-manufacturing, tourism, construction and telecommunications, which more than compensated for the sharp downturn in petroleum extraction, domestic electricity generation and cruise-ship disembarkations. Also, and to broaden the point about how comparatively stellar our six performance was, the Central Bank reports that this growth is notably above the entire Latin American and Caribbean Region’s estimated average of three percent. In the primary sector, the rehabilitation of storm-damaged acreages and favorable agronomic conditions helped banana production to increase by thirty-nine point nine percent while citrus also recovered from weather-related damages to post a fourteen point three percent increase in deliveries. A relatively uneventful season that was not plagued by the difficulties of the previous year because Government had helped to solve those problems, facilitated a twenty-two point six percent increase in sugarcane deliveries. The strong outturn of citrus fruit and sugarcane deliveries bolstered agro-manufacturing activity so that production of citrus juices and sugar production rose by twelve point eight percent and fifteen point four percent respectively. Notably, sugar production for the 2011/2012 crop year exceeded the one hundred thousand long ton mark for the first time since the 2005/2006 crop; and the average price paid to farmers was adjusted upward from sixty-eight dollars and twelve cents to seventy-two dollars and twelve cents per long ton of sugarcane.